Oh my, oh my. I was just looking through my Facebook feed (yes, I do that sometimes when I’m bored) and saw that someone posted a link about the new Maybelline Great Lash Limited Edition of 2012. You probably am thinking why I’m writing about this when I saw this on Facebook. Well… Because I’m super excited about them! The Maybelline Great Lash was actually my first ever mascara! Haven’t used it ever since I threw the bottle away, which is like at least 6 years ago… This year, or well actually, this month they have the limited edition of this mascara in 4 amazing colors. The available shades are Pop of Purple, Blink of Blue, Go Go Green, and Totally Teal. The Great lash color collection will enhance the natural eye color and the shape of the eye by defining the lashes. It will also conditions the lashes, making them look better than ever. 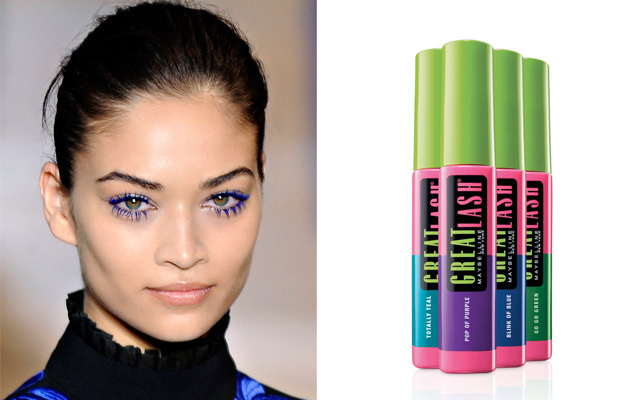 I’ve seen this great mascara trend at Stella McCartney’s A/W 2012 runway show, so what would be a better way to try it out yourself? It’ll be sold in the States for only $6,40, and will be available nationwide. For the other parts of the world… I honestly have no clue. I will keep my fingers crossed that it’ll be launched in Europe in September, otherwise I’ll keep my eyes peeled on eBay! Would you wear a colored mascara? Previous Post My MacBook’s Gotten Feet! Next Post The 3 P’s: Planning, Packing, and Paris!